Invacare introduces the next generation hospital bed. The Invacare Full Electric Hospital Bed offers a number of innovations that translate into long term savings over the product lifecycle. The new Invacare bed components such as the Universal Bed End, headspring, and footspring are interchangeable with your existing supply of Invacare beds, for easy bed upgrades and enhancements. These new features of the Invacare Full Electric Hospital Bed are designed to be easier to deliver, setup, clean, and maintain. 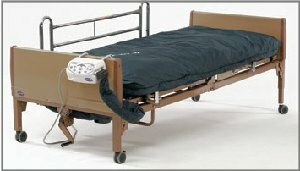 The Invacare Full Electric Hospital Bed is by far the most popular hospital bed. All 3 positions of the bed are controlled electronically to provide the greatest convenience for the patient and caregiver. The hand pendant raises and lowers the positions of the upper body and/or knees. The bed frame height of the Full Electric Hospital Bed is also adjusted by the hand pendant. The microAIR APM provides pressure relief in the prevention and treatment of pressure ulcers. This Group II support surface has a 250-lb weight capacity. This microAIR Alternating Pressure Mattress has 16 horizontally configured bladders. Mattress will not bottom out with mattress hose attached to the compressor power unit. This alternating pressure mattress provides a temperate climate for patients with its ability to circulate air within the mattress. OPTIMIZED BY GOSOUTHERNMD.com. THIS IS ONE INCREDIBLE DEAL.